Data Entry Job Circular 2018! Data Entry Job Circular 2018! A new job circular available here for all. This job circular available for Bangladesh all people. And female or male can do this job. One of the easiest jobs is it. There is no any educational experience need. In this post, we added a new job circular details. 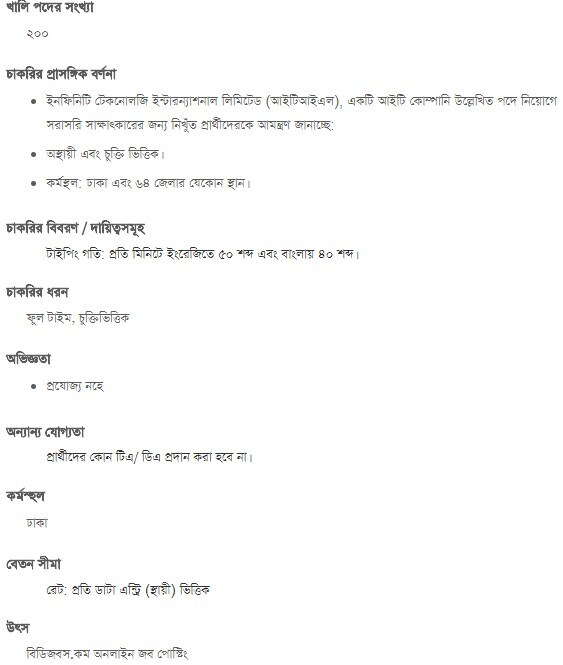 If you want to know this just read this full post and get this job circular details. Infinity Technology International Ltd recently provides a new job circular. They need 200 workers on their company. If you want to do this job you can apply here. Below we added this job circular full details. Just read this full post and get this job full bio. Here full details of this job circular. We added this job details via the Image file. Send your CV to hr@infinitytechltd.com or contact directly via office this address Infinity Technology International Ltd. Address: House # 675 (3rd Floor), Road # 10 (Old Road # 26), Mirpur-DOHS, Dhaka-1216, Bangladesh.